London is one of the busiest travel hubs in the world. This makes it a convenient stopover when traveling to Europe and other countries around the world. Even if you only have a few days in London, it is an excellent place to explore and enjoy some of the best the sights, pubs, and churches in England. Let us take a quick trip through "Old Smoke" and discover how to make the most out of spending 72 hours in London. If it is a clear morning, which is always a concern in London, take advantage of the weather by exploring Hyde Park for a couple of hours. This massive royal park was once the deer hunting grounds of Henry VIII and has the oldest boating lake in London. Favorite things to do in Hyde Park are to stroll through the rose gardens, wander to Kensington Palace, or grab an English breakfast on the waterfront. Hyde Park is a perfect stop to kick off our London adventure. If it is a rainy day, head to the British Museum. This world-famous museum holds one of the most impressive collections of art, statues, and historical artifacts in the world. It has massive assortments from different time periods that span every corner of the globe. It has priceless artifacts like the world famous Rosetta Stone, which played a pivotal role in deciphering hieroglyphics. Nowhere else in the world are you able to see such an incredible amount of priceless treasures for free. That's right, a fantastic perk of visiting this museum is that it has free admission to the public. Every London trip should include at least one teatime. It is one of the most well known and oldest of English traditions. No matter wherever you are in the city, you are close to a place to grab a buttery scone, finger sandwich, and a spot of warm tea. After the British Museum head to the nearby Tea and Tattle for the perfect teatime. After teatime catch the underground to Westminster Station where we will spend the rest of the afternoon. Here on the bank of the river Thames we have Parliament, Big Ben, Westminster Abby, and the London Eye all within walking distance. These iconic attractions should be in included on every London itinerary. Walk around, get some pictures, or take a ride on the London Eye. This area is buzzing with street performers, markets, and living statues. Next, head to Westminster Abbey, a building that is steeped in English history. Here William the Conquer was crowned the first king of England. It also holds the graves of famous Brits like Oliver Cromwell, Geoffrey Chaucer, and Charles Darwin. Also along the river, reachable by a long walk or quick bus ride, are a few other highlights including the Tower of London, Tower Bridge, Shakespeare Globe and the Boar Market. The river Thames area is one of my favorite spots to spend an afternoon in the city. After work, people head to the pubs for a couple of pints before venturing home. The pubs are lively with people laughing and chatting. To round out of first day in London take a break from exploring and join in the local pub culture. If you are still near the river, there are dozens of bars within walking distance. A personal favorite of mine is the Sherlock Holmes Pub. This pub has excellent drinks, a restaurant, and the upstairs has been renovated to mimic Sherlock’s Holmes apartment and office. If you are a Sherlock fan, this pub is a great place to stop. Of course, we need to see the royal residence on our trip to London. Wake up early and head to one of the nearby parks for a morning walk towards Buckingham Palace. These parks are huge, well manicured, and lavish. Enjoying the morning sun as it lights up the still ponds, tiny cottages, and tree lined footpaths is a wonderful way to start the morning. I am always amazed at how a little stroll through these parks makes it is easy to forget you are in a hectic city. Take your time and enjoy the park but make it to the Palace by 11:00 to get a good spot for the changing of the guard at 11:30. This event takes place every day during the summer and every other day during the rest of the year. Hop back on the underground and head to some of London’s bustling streets. London has some great neighborhoods for eating, shopping, and wandering around. A few famous areas to check out are Leicester Square, Oxford Street, and SOHO. For your second evening in London, you have a few options. One recommendation is to go see a play at Shakespeare Globe, which lets you experience a play as it would have been in the days of Shakespeare. The playhouse is located in the same spot where Shakespeare held his plays hundreds of years ago. Another option is to catch a theatrical production in the West End, one of the world’s most famous theater venues – like Broadway in New York. Be sure to book tickets before you leave home though; plays often sell out. For our last day in London, we are going to explore a couple of the different neighborhoods. First head to Notting Hill. This area shows off the classic London houses. However, the major highlight of visiting Notting Hill is the Portobello Market. This is a massive street market that has been open since the 1800’s. Nowadays the market has become a bit of a tourist attraction and there are thousands of little shops that are perfect for picking up last minute souvenirs and antiques. Camden Town is one of my favorite areas in London. The area has a fun vibe and eccentric atmosphere. The major attraction is the Horse Stable Market, which is another fabulous place for shopping, as well as trying the street food for all over the world. Camden Town has a variety of small little rock pubs and dive bars that are worth checking out. 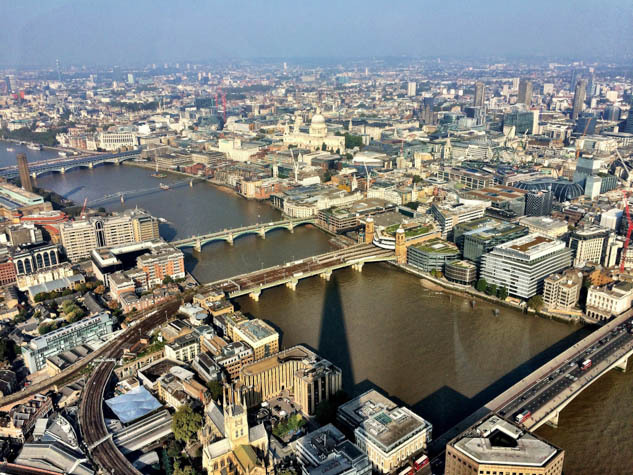 For sunset head to the Shard which is the highest viewpoint in London. The Shard, one of the tallest buildings in the UK and Europe, has become a famous landmark of the city. As we watch the sunset over the city, it is an excellent bookend to our 72 hours in London and a good place to view the city below. London is a fantastic city to explore. The city is easy to get around, and many of the streets and neighborhoods are unique. This 72-hour itinerary for London gives you a good overview of not only the sights in the city but also English culture.